Keep focus on your profession. Manage your business more easily and quickly with our intuitive and affordable software. Propulso is complete, simple and affordable. See why so many people use our software on a daily basis. Gather everyone of your clients and manage their contact info. Issuing invoices and receipts couldn’t be quicker and easier. Take control of your schedule and never miss another appointment. 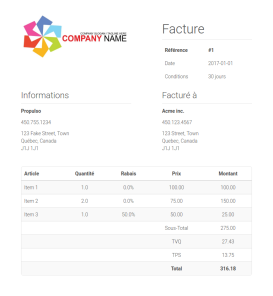 Keep track of your interactions with clients by adding notes, pictures and documents to their file. You work hard; make sure you get paid on time and by various payment methods. Quickly look at your sales, incomes and upcoming appointments. Easily send an invoice by email or an appointment reminder via SMS. Simplify your estimation process and get fairly paid with our quick and professional quotes. Forgot to send a reminder or to issue an invoice? Don’t worry, our software has you covered! Mobile, tablet, computer, Android, iPhone, Mac, Windows and so on… everything is supported! Don’t worry about backups and updates, everything is taken care of for you! Your clients’ information and personal data are safe. Add your personal touch with your logo, your colors and your own texts. Coming really soon: Add a customer center to your website to allow your clients to pay online or to schedule an appointment according to your schedule. We add features every week based on our users demands and needs. Forget complicated backups, updates and installations; Propulso takes care of it for you! Instead focus on your work via your mobile, tablet or computer. Propulso supports more than thirty professions and has many configurable options. Invoice templates, fields of client records, emails text; anything can be adapted to your reality. Have peace of mind, we take care of everything in collaboration with our well-known and experimented technical partners. We would be happy to chat with you! Whether you have general question, a technical issue or the desire to discuss your needs, don’t hesitate to contact us. We are available from Monday to Friday, from 9am to 4pm.. Wait, don't miss our special offer! Just like +200 freelancers, take advantage of our limited time offer for a free 30-day trial. Due to a high volume of subcriptions lately, we have closed all new subscriptions until January. Please feel free to contact us if you want to register before (we still have a few places).